You don't become a police officer by accident. Twisted things happen all the time in our crazy world. But you're all about making things a little bit better. You started from the bottom like all the other officers. Writing parking tickets, pulling over distracted drivers, and helping elderly folks cross the street. But then your sharp mind and attention to detail paid off. One day you noticed a young man was dressed as an old guy, wrinkled mask and everything. After doing a little digging you found out he was actually wanted, the authorities had been looking for him for months. Next time you saw him fake limping over the street in an argyle sweater you called for backup and arrested the imposter. Good thing you've spent so much time on our site! You know how to recognize a quality mask when you see one. You'll be ready to keep the streets safe from triflers and sneaks when you're dressed up in this fashionable but no-nonsense policewoman ensemble. You'll like the slim cut pants that can be paired with cute boots or sensible shoes. The button up short sleeve top is cinched with a wide belt, perfect for holding your handcuffs. The look is topped off with a structured hat and polished with metallic badges to make you look official. Are you ready to put the grind to crime? Well, we're not sure if that's even a saying but we're sure you know what we mean. 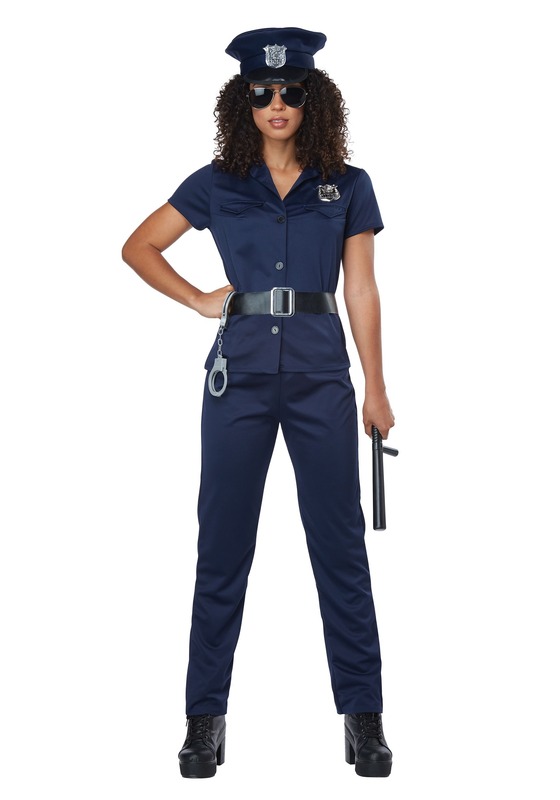 Whether you're ready to head out into the world with a chip on your shoulder, wandering around and saying "I'm too old for this" or you're more of a rookie looking to make the world a better place, this cop costume is sure to make this Halloween a favorite!